This page covers GCSE Maths, the exam taken by the vast majority of state and independent school students in May/June of year 11 (when they are 16 or will shortly be 16). See other pages for iGCSE (International GCSE) an alternative to GCSE and “Extra y11 exams” for tougher exams that are taken in addition to GCSE or iGCSE. Since 2010, no GCSEs in Maths have assessed course work; the GCSE is awarded entirely on Exam results. The last chance to take the old Maths GCSEs graded A* to G was in June 2017. The only GCSE syllabus available is graded 9 to 1. These new “9-1” GCSEs are much tougher that the A* to G exams with more content than before and less predictable questions. Maths now counts as 2 GCSEs in schools’ performance tables (but not, I’m afraid, in the students’ academic record. What Maths is in the “9-1” GCSEs? Many exam questions now involve several steps to achieve the answers. Students are not told what the steps are; they need to understand the Maths sufficiently well to work out how to break the question down into steps. Fewer formulae are given to students in the exam. They need to remember many more of the formulae that they’ll need to solve problems. Students are called upon to comment on methods used to solve problem. There are two separate tiers for Maths GCSE exams, Foundation and Higher. Foundation is an easier examination than Higher. There are 9 grades available – 9 is the best, 1 the worst and U (unclassified) remains possible for those unable to achieve 1. The Higher Paper will offers grade 4 to grade 9 and the Foundation Paper offers grade 1 to grade 5. Someone taking the Higher exam should have been taught all the Maths in the Foundation syllabus plus the parts of the syllabus that are Higher only. The lower limit of the new grade 4 is the same as the lower limit of an old grade C. Grade C had been a major benchmark grade for school performance. 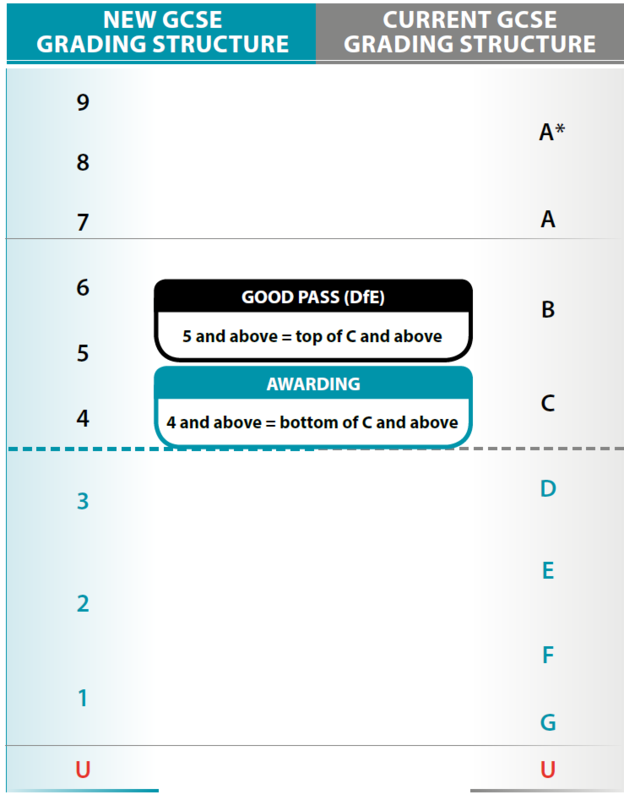 Conversely new grade 5 will be seen as a “pass” – this is towards the top of the old grade C band. It seems likely that this new grade 5 will be the benchmark in future for school performance but this has not been announced. The lower limit of a new grade 7 is the same as the lower limit of an old grade A. Please note the possible confusion with the new grade numbers. They are not in any way related to the “level” numbers used until 2016 by most state schools to assess their 11- to 14-year-old students. Set 5 – 15 students. Note that the less able the student, the better the teacher-pupil ratio. Despite this, as a parent, you should want your son or daughter to be in the highest set that he or she is comfortable with – A lot more learning takes place in the higher sets than the lower sets, despite the worse teacher-pupil ratio. In big schools with 150 or more in a year, it is quite common for there to be 2 top sets, 2 second sets etc. Any school should be open to moving students between sets; schools will consider this formally at the end of each school year and often more frequently (especially for year 7s). Especially in bigger schools, the most important criterion for a move will be the marks achieved in end-of-term tests or similar. Remember though – for one child to move up a set, another needs to move down. Once the school starts to actually teach the GCSE syllabus (usually September in year 10, but earlier for some schools in our area) the setting becomes very important. The lowest sets will only be taught the Foundation Syllabus so moving between sets becomes very difficult. Once a student finishes year 9 with a poor test result it can be almost impossible in some schools to be taught Maths which will give him or her better than a grade 4. Having consistently good results in year 9 will ensure that your son or daughter gets into the best possible set for GCSEs. This can be helped by a well-timed letter or email to the head of the Maths department pointing out, for example, that your son or daughter has improved in Maths recently and asking for an upgrade to a higher set. Please note the possible confusion of the work “Higher” – the two tiers of the English GCSE Maths “Foundation” and “Higher” have nothing to do with the Scottish “Higher” exams for 17-year-olds. Students who don’t achieve the desired grade in May/June can re-sit the Maths GCSE exam in November. Maths and English Language are the only 2 subjects with resits in November; other subjects will only be examined once per year in May/June. The following boards offer the “9-1” GCSE from May/June 2017. The Reforms apply to England, neither to Wales nor Northern Ireland. I’ve never come across a school in our area using the WJEC papers. There are no past papers available to the public yet. The May/June 2017 papers will become available in August 2018.